Facebook used to offer email services, but they discontinued it. I wanted to send my friend Steve an email with Siri. At first, Siri kept sending it to a non- existent facebook.com email address. Not sure how this is happening, though I have pushed the button before to update contacts from Facebook; I’ve never seen these entries in anyone’s contact card. In May 2016, these email addresses were entirely discontinued. In Chris’s case, it’s possible that he doesn’t have automatic Contacts sync enabled for Facebook. In macOS, you find this in the Contacts app in Contacts > Preferences > Accounts. If a Facebook item appears, select it and you can see whether Enable This Account is checked. You can control all Facebook sync options in the Internet Accounts system preference pane, too. You can opt to not sync contact data from Facebook, which should delete it off your system. 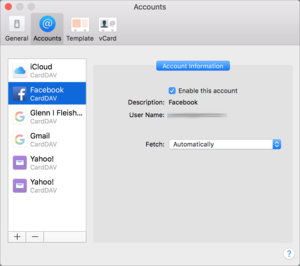 Many people don’t want Facebook gaining more information about them, or sharing Facebook information with the rest of their systems, so have these options disabled. When those sync options are disabled, any entry associated solely with Facebook should disappear from your computer. But it’s possible with earlier versions of sync for OS X that the contact data would have been imported rather than just synced, leading to this problem. Chris should be able to delete any facebook.com addresses or enable automatic sync, which will clear them out if they’re still linked to the original records.